Make no mistake, friends: this is a golden era for mobile gaming and it feels like it's only just begun. The number of high-quality, beautifully crafted, visually stunning and instantly playable titles on Google Play grows by the day, with developers lining up to get their innovative and affordable titles into our hands. This recent explosion in mobile gaming has arisen from huge technological leaps made by devices such as the Samsung GALAXY S4, which have turned our mobile phones into legitimate handheld games consoles. With masses of processing power, a generous high-definition screen, an advanced graphics chip and a highly responsive touchscreen, the S4 has certainly given developers all the tools they need to create great titles. We asked staff from Zen Studios – behind titles such as Star Wars Pinball – about their experiences developing games and testing them on the GALAXY S4. Creative Director Neil Sorens explains: "The limited hardware of mobile devices has required a lot of effort on our part to optimise the software, in some cases resulting in simplified physics and geometry. When we got our hands on an S4, though, everything just worked – the game ran smoothly with no hitches, even with the full HD resolution. That was a big relief, since GALAXY S4 users are a huge portion of our Android user base." Ed Rumley, COO of games publisher Chillingo, the company that brought us Feed Me Oil, Contre Jour and more, agrees. He told us: "Whenever a new device arrives we have to look at the market and ask, 'Is it going to benefit our developers to ensure their game runs perfectly on the new hardware?' In the case of the GALAXY S4, it was an easy answer. The device is extraordinary, so we wanted to make sure our Android games looked extraordinary on it." Other developers have followed suit and there are lots of games now perfectly optimised to harness the 5-inch Full HD Super AMOLED screen, 1.9 GHz Quad-Core processor, super-powerful graphics chip and software advancements like Group Play. 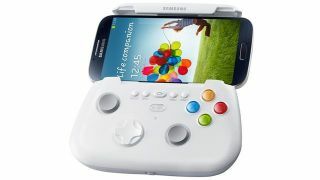 Not to mention that made-for-GALAXY Game Pad (pictured above) that will be hitting stores soon. Here are our 10 favourite games for the GALAXY S4. All are available from the Google Play store or Samsung Apps on your device. We're suckers for Star Wars and the 5-inch Full HD Super AMOLED screen on the GALAXY S4 brings the wonderful complexity of the tables from a (lower case) galaxy far, far away, in supreme detail. The game requires you to complete a number of challenges that involve battling Stormtroopers, firing at Darth Vader when he climbs on to the table, helping Luke complete his training and guiding the Millennium Falcon through an asteroid field. A smaller, lower-res screen just wouldn't cut it. Soren says: "The small screen that most phones have tends to make our pinball tables, which are packed with small details and designed for large, high-definition displays, somewhat cramped. The GALAXY S4's extra screen space and high resolution alleviate this problem." Do you have what it takes to unlock the secrets of The Room? The UK's own Fireproof Studios has developed the most absorbing, intuitive and visually impressive puzzle game of the mobile generation and it's now available for the Samsung GALAXY S4. Inspired by browser-based 'escape the room' games, The Room asks you to unlock the mysterious secrets of an obsessed scientist by swiping, pinching, prodding and maneuvering your way around the endlessly interactive, beautifully rendered room. Unlocking one door eases you seamlessly into the next clue, while the eerie, atmospheric music and lighting effects make it a great one to play in the dark, taking advantage of the GALAXY S4's superior audio and powerful graphics chip. The adventure will continue in a sequel coming soon.